PLEASE READ: The SMS 1 does not require a modification for RGB-output, simply a cable. The SMS2 does require a mod, but a “bypass” isn’t required, you just need to connect pins and add an output jack. 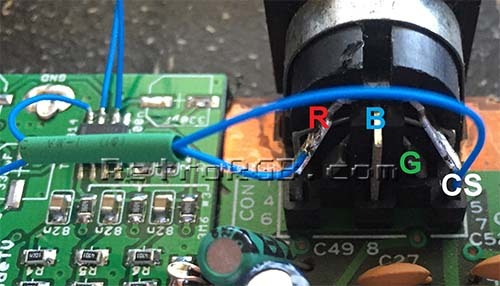 This page is an “experts-only” page that shows how to bypass the internal RGB amp with a different one. All details are below, but this mod requires you to make irreversible modifications to your system. Beginner and intermediate modders should not try this mod! 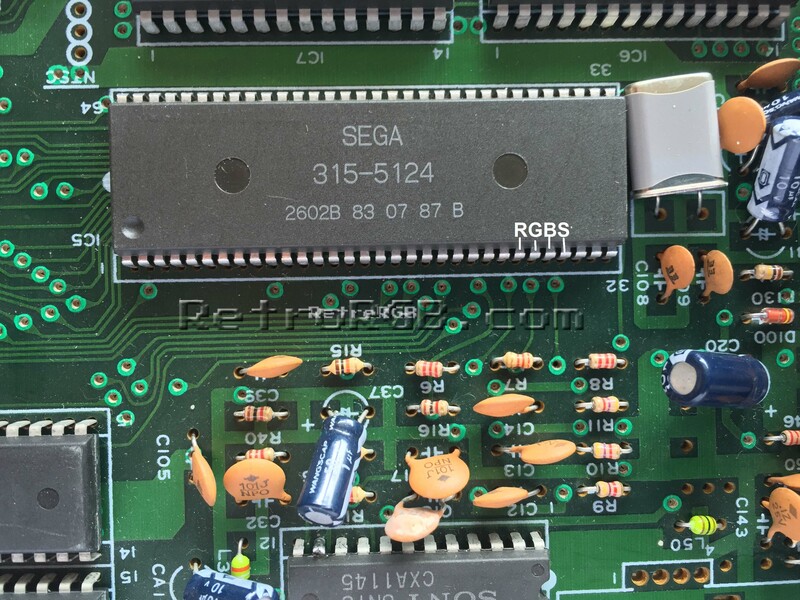 NOTE: This page will soon be updated to reflect the latest jailbar fixes / RGB bypass solutions available for the Sega Master System consoles. 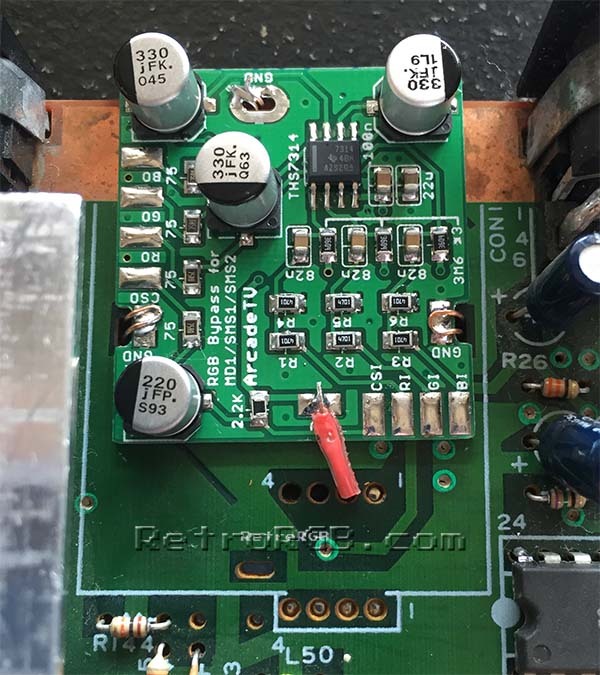 The basic instructions (where to tap RGBs, sever connections and solder to the multi-out) are accurate though and the only things that will change are specifics related to the boards themselves. 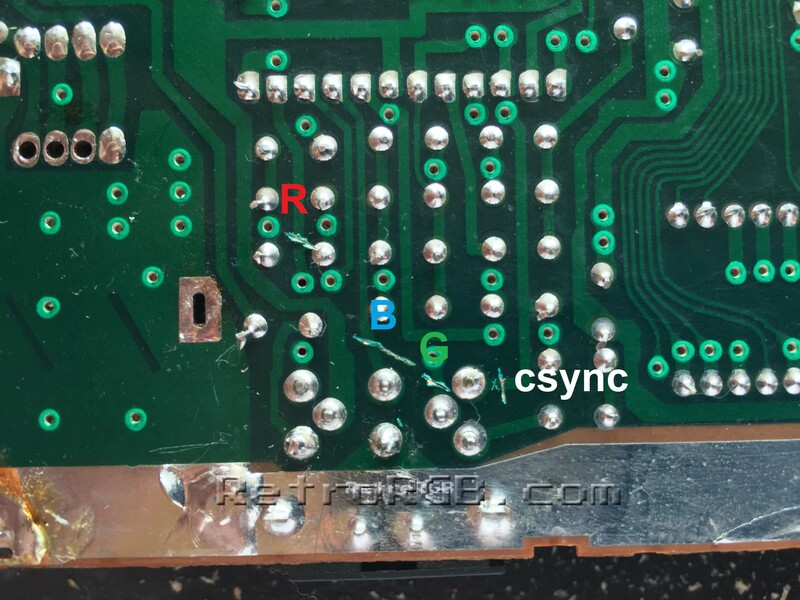 Jailbar fix: As shown in the picture above, performing this bypass removes most (but not all) jailbars from Sega Master System consoles. Please note that there are many different ways to reduce jailbars and doing an RGB bypass is just one alternative that I prefer. 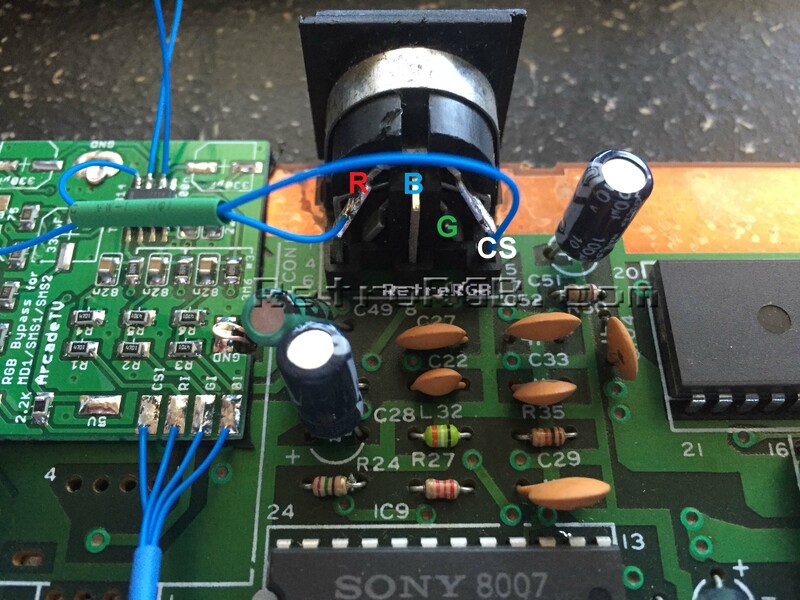 New RGB Amp: All SMS systems use a Sony CXA1145 chip to amplify the RGB signal. The CXA1145 is an excellent chip, however this bypass uses the newer Texas Instruments THS7314, which has a high-quality low-pass filter that removes unwanted noise. Using the THS7314 isn’t a clear “better or worse” choice, it’s mainly a preference. Some might argue that the “ringing” the CXA1145 produces creates the specific look of the SMS that we’re all used to and shouldn’t be changed. I’ll leave that up to you. SMS RGB issues: I’ve had many people email me regarding SMS RGB issues, using the stock multi-out. There are a few solutions for this, but performing this bypass will guarantee that your SMS will be compatible with all RGB setups. Here are instructions on installing a bypass in an SMS 1. You can follow the same instructions for an SMS 2, however since there’s no multi-out, you’ll need to mount your own. If you plan on using a custom output connector, you can skip this entire section and go right to “removing the RF module”. If you’re using the stock multi-out, you’ll need to sever the existing RGB lines on the board. If you’re using any other output connector (or have an SMS 2) you can skip this. 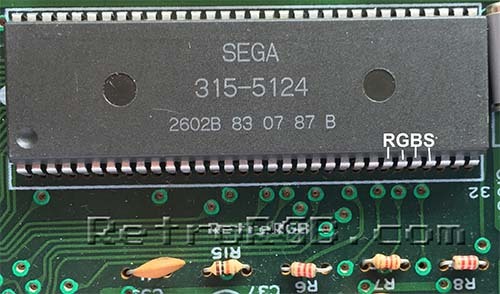 Alternatively, if you have a motherboard that connects directly from the CXA1145 to the multi-out (most NTSC’s do), you can cut or lift the CXA pins. Also, if you have an MK-2000, you can try cutting components between. I definitely prefer the above method though. 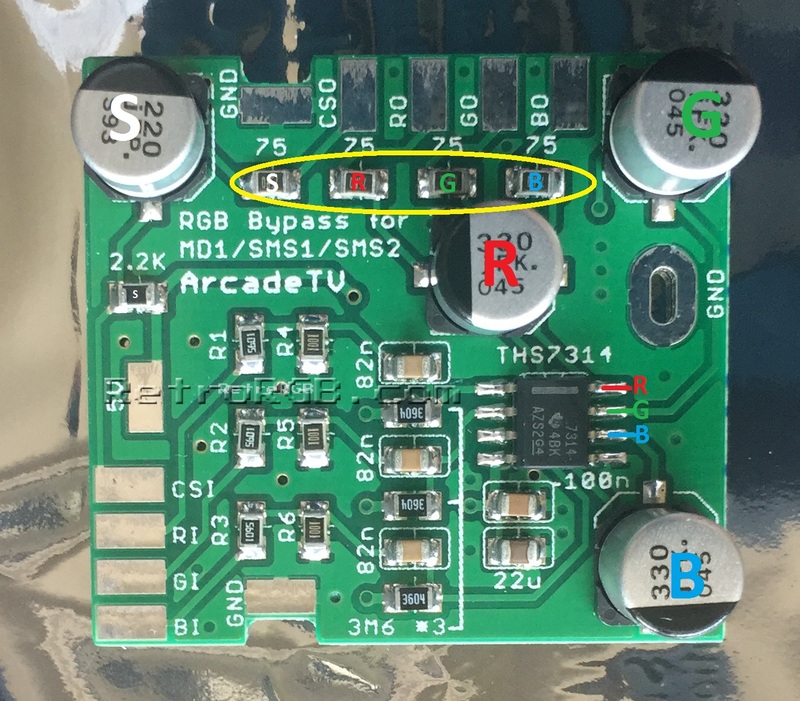 If you’re using a stock SMS / Genesis cable, you’ll need to remove the RGB caps on the board. You can then connect RGB on the multi-out to the “input” side of the capacitor pads. Alternatively, you can remove the caps and just solder directly to the THS7314. You can leave the resistors on, as removing the caps will bypass them altogether. 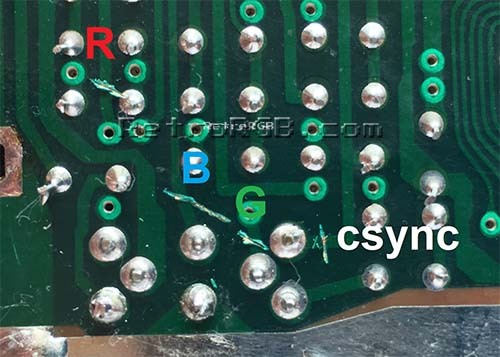 If you’d like to use luma as sync, just solder a wire from pin 16 on the Sony CXA1154 chip to CSI on the bypass board. – Now connect RGBs-out to the multi-out. I actually prefer soldering to the top of the multi-out, to keep the wires from getting pinched. 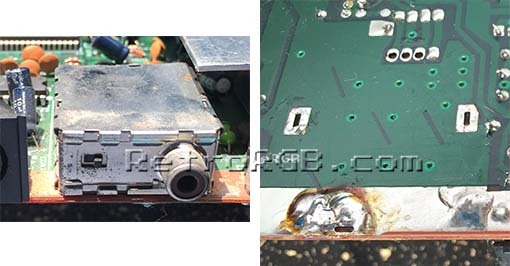 This picture shows the bypass board with the capacitors removed (for use with stock SMS cables) and RGB-out coming directly from the chip (the B&G wires aren’t connected, as they would have blocked the view in the picture). – There will always be some noise or jailbars on SMS consoles, but after performing the mod, it should be greatly improved!